The guestbook for the wedding of my niece Carly and fiancé Sean is finished. The album was one that I've had for awhile. 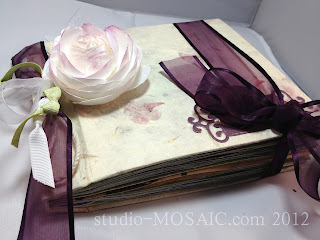 It has beautiful flower petals embedded in the handmade paper on the cover. I used most of the handmade pages that came with the album but hand-colored all of them. The paper for these pages is delightful....great texture and strength. I took the whole book apart and rebound it with a stitched signature and adhesive. Other pages in the book are made of various cardstock. Eggplant, green, white and cream are the main colors with Eggplant highlighted to match her wedding color choice. These pages contain pockets for an assorted number of tags. Guests will be able to leave a message, or just a signature on tags or on any page - wherever they want. There should be enough room for Carly and Sean to journal on pages or tags later on. This was a joy to design and create! !